Back at the beginning of May we had some warm days – it seemed summer was just around the corner. So Kit has got her beach clothes out and now she’s all ready to join the fun just as soon as summer really does arrive. 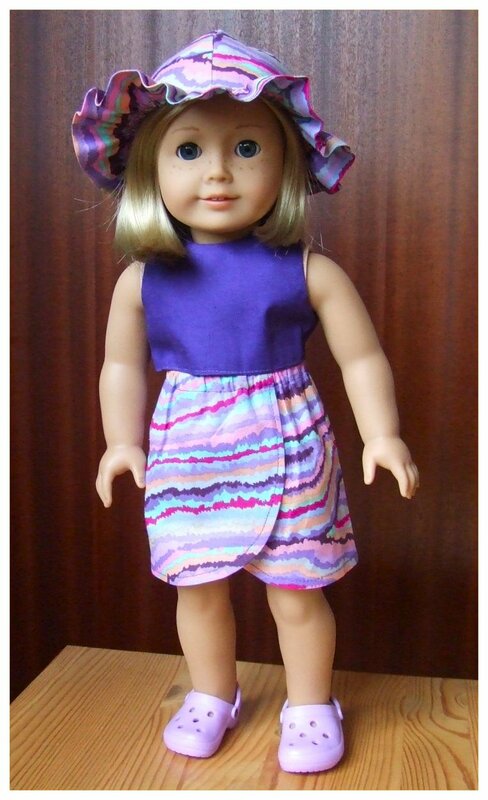 I put this little outfit together when I was working through Rosie’s doll clothes course. The three patterns came bundled with the course: a sarong (short as here, or long), a crop top, and a sunhat. In making up the garments you practice various skills: sewing curves, top-stitching, inserting elastic and gathering fabric into a seam. I made all three garments from two fat squares. The sarong was quick and easy to make, and can double as a wrap-around skirt for the summer. A very easy-to-wear garment which dresses up nicely for more formal wear, as I’ll demonstrate in a later post. The crop top construction was very similar to the bodice on the summer dress I had made before, except that here the bottom edges of the top are turned in and top-stitched to secure them. I feel the top is not quick cropped enough: next time I’ll shorten it slightly to reveal a little midriff – but not too much as Kit’s an old-fashioned girl and feel uncomfortable with too much flesh on show! 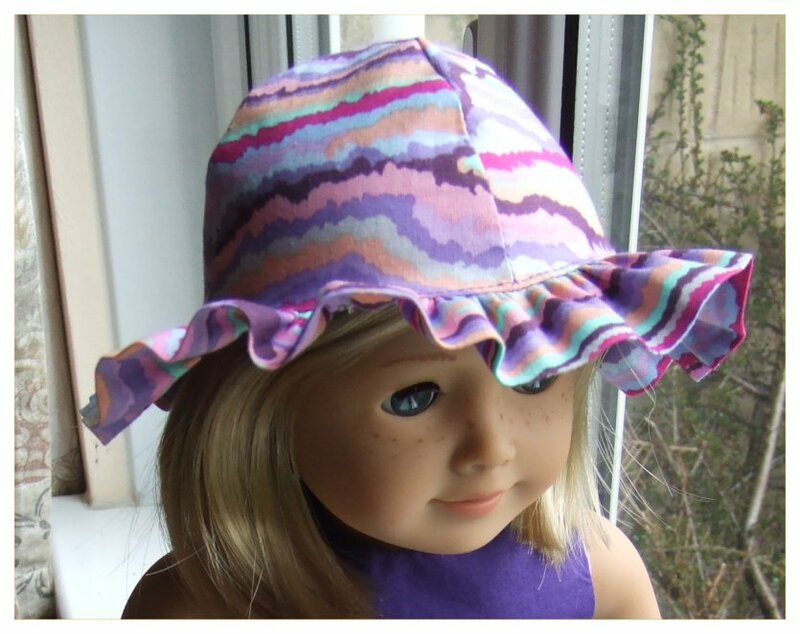 The real challenge here was the sunhat which needed some careful seaming to achieve the fitted shape. The body of the hat is cut in one piece with four dome-shaped scallops which are stitched together to form the crown of the hat. Then the brim is doubled over and gathered into the edge of the crown. There’s a lot of fullness to gather up, and it’s important to distribute the gathers evenly. I was very glad of Rosie’s video instructions to guide me while I worked on this. It really is a great little outfit. I love the patterned fabric which combines lots of colours that really suit Kit’s summer colouring: there are so many sweet pea shades here along with a blue-green that picks out the hint of turquoise in her eyes. The dark violet of the crop top contrasts well and is assertive enough to balance the strong pattern on the sarong and sunhat. Kit has teamed up her outfit with her mauve crocs which are manufactured by Gotz. They’re just right with this cheerful summer combo.